Having been founded back in 1881, FC Girondins de Bordeaux can certainly boast with a colorful history. In addition to being one of the oldest clubs in the country, they are also one of the most successful. Bordeaux team in 1941 after winning Coupe de France. When Bordeaux was formed, it was originally a gymnastics and shooting club. After a trial period in 1910, the footballing section was officially introduced in 1919; however, it wasn't until 1936 that Bordeaux finally went professional. 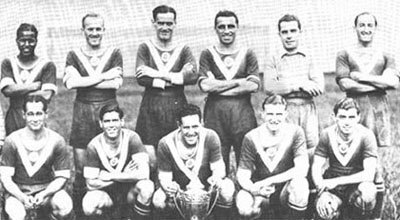 Their first major silverware came during the occupation of France, with a 2-0 victory over SC Fives in the 1941 French Cup final. The post-war period saw the club go one step further and win the Ligue 1 in 1950, in their very first season in the competition. After a couple of decades of struggle that saw the club lose five French Cup finals in a row, Bordeaux was bought out by businessman Claude Bez in the late 70s. As one of his first orders of business, Bez appointed Aimé Jacquet as the club's manager. Under Jacquet, Bourdeaux quickly established themselves as one of the leading teams in the country during the 80s. In Jacquet's nine years at the helm, Bourdeaux won three Ligue 1 titles and two French Cups. They've also had some solid showings in Europe during this period, including two European Cup semi-finals. The club continued to be a force to be reckoned with through the 90s, but additional silverware was hard to obtain. Led by their new young star, Zinedine Zidane, Bordeaux managed to reach the UEFA Cup final in 1995, but Bayern Munich proved too strong of an opponent. In 1999, Bordeaux finally won its long-expected fifth Ligue 1 title following a dramatic last-day victory over Marseille. The 00s saw Bordeaux make multiple deep runs in both major European cups, but they would eventually have to settle for two League Cups in 2002 and 2007. As it turned out, however, that was only an appetizer for what would come next; in 2009, the club would achieve their first "Double" by outlasting Marseille in the title race and defeating Vannes in the League Cup final. The following period saw Bordeaux dip in form, with multiple mid-table league finishes and disappointing Cup losses over the next couple of years. Their last major trophy would come in 2013, with a hard-fought 3-2 victory over Evian TG in the French Cup final. In 2015 the team moved from Stade Chaban-Delmas (former Parc Lescure) to the Nouveau Stade de Bordeaux (a.k.a. Matmut Atlantique). The new stadium has a capacity of almost 10,000 more than the former. The logo of Girondins de Bordeaux has always included the characteristic V-shape (or chevron). In French it is called scapulaire (scapular in English) and is originally a symbol from the navy.